PROSPECT - SWINDON, THIS IS SWINDON. The Prospect Aerated Water Company was formed in 1885 by Mr John Elliot, his sons Mr Alfred Russell Elliot & Mr James Isaac Elliot and a Mr William Clarke. 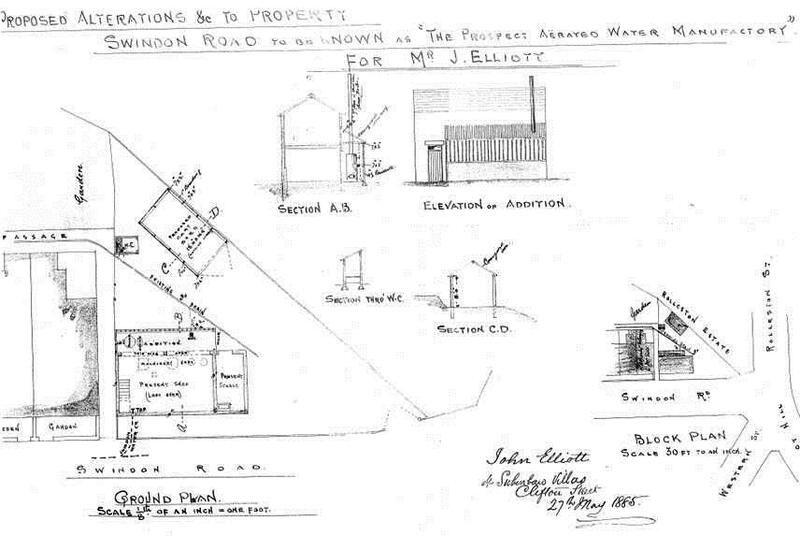 That year John Elliott drew up plans to turn an existing shed and stable into the Prospect Aerated Water Manufactory. The building at the junction of Swindon Road and Rolleston Street, would have a water supply courtesy of the Swindon Water Co's main in Swindon Road and an additional adjoining building would be added to house a steam engine. The factory was next to be owned by the CROOK family.